Kelli Jae Baeli, Indie Publisher with Indie Literati Press and Lesbian Literati Press, and author of over 45 books, numerous articles, stories and essays, shares some thoughts about the writing craft and the writer’s life, which necessarily also includes lots of reading, followed by thoughtful examinations, splenetic ruminations and often humorous outbursts of weirdness. “First, an opinion isn’t always a fact. Second, you can’t please everyone. 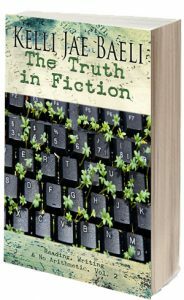 And third, and most importantly, (and with the most paradoxical irony), this concept: I may have failed to do the best job on a book, if I didn’t make the fiction seem like truth, even if the truth seemed like fiction. Truth is, as the adage goes, stranger than fiction, and thus, when it appears, it is perceived as lacking credibility, even though FICTION is, by definition, NOT TRUE. So there will always be readers who lament the lack of credibility in some aspect of fiction, when many times the depiction is accurate, it just doesn’t SEEM accurate. So therefore, we, as fiction writers have to be careful to be credible and realistic, while lying our collective asses off. Are you following this?